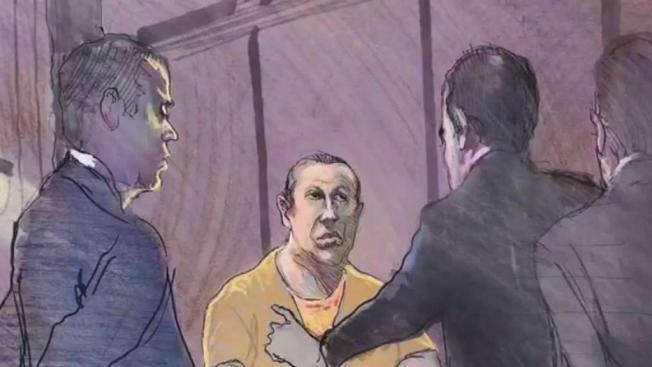 Pipe bomb suspect Cesar Sayoc will not seek immediate release on bail and agreed Friday to be transferred from Miami to New York for trial. NBC 6's Marissa Bagg reports. Mail pipe bomb suspect Cesar Sayoc was accused earlier this year of throwing urine from his van at two women on a moped in an apparent road rage incident in Florida, according to a police report. The Hollywood Police Department report obtained Friday says Sayoc pulled up near the moped at a traffic light in his white van plastered with pro-President Donald Trump political stickers, began yelling obscenities and tossed two vials of urine at the women, drenching one of them. The women, 32-year-old Indiana Parra and Rimbow Gomez, 29, told police Sayoc attempted to chase them during the March 16 encounter and possibly tried run them off the road, but they swerved into a warehouse parking lot and he drove on. One of the women told a police officer that a "maniac Trump supporter threw (urine) on us" and they knew it was urine "by the smell," according to the report. The women reported the license tag on Sayoc's van, gave a description of both him and the vehicle and gave samples of clothing for DNA testing. Court records, however, show Sayoc was never charged. Months later, authorities say he began sending out the pipe bombs. He was arrested Oct. 26 in Plantation, Florida, in an auto parts store parking lot with his white van. Sayoc, 56, is accused in New York of mailing 16 improvised explosive devices to Democrats, critics of President Donald Trump and to CNN. He faces life in prison if convicted. Sayoc has pleaded not guilty. None of the devices exploded and no one was injured. In the 30-count New York indictment, prosecutors said an improvised explosive mailed to former Democratic presidential nominee Hillary Clinton in Chappaqua, New York, contained a picture of Clinton and members of her family marked with a red "X." The Miami Herald first reported the Florida urine incident. Sayoc has had numerous other arrests in Florida, including one incident in which he threatened to bomb an electric utility in a dispute over his bill.